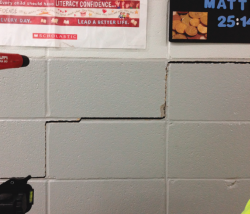 Indianola Academy in Indianola, Mississippi began noticing large cracks in their hallway walls and, pencils rolling off of the students’ desks. After evaluation, it was discovered that there was a three inch settlement in their foundation. URETEK was called in to lift and level the school’s foundation, which would close the cracks and eliminate the leaning desks causing the pencils to roll. By utilizing URETEK’s non-disruptive polymer injection technology for foundation repair and concrete leveling, the Academy was able to fix it’s foundation problems fast – without having to wait until the end of the school year. URETEK was able to lift and level the Academy’s three-inch foundation settlement over just one weekend, so that no disruption would be made to normal school operations. No major furniture movement was required, no carpet or tile removal was needed, and the small injection holes were grouted and sealed afterwards. The area was ready for full use again 15 minutes after project completion. URETEK’s concrete lifting and foundation repair services save school and university facilities time and money when repairing foundation, concrete settlement, and infrastructure damage on their properties. URETEK specializes in improving the weight-bearing capacity of subsurface soils through the injection of patented, lightweight, rigid, structural structural polymers. Our structural polymers can be used to void fill, seal, lift or stabilize a variety of structures. Easy on Customer: No major furniture or appliance moving. Affordable: Less expensive than traditional repair or replacement methods. Low Disruption: No carpet or tile removal is needed. Zero-Excavation: Small injection holes that are grouted and sealed after. Long-Lasting: Strong, long-term repair solution. Little to No Mess: Small amount of debris is removed immediately. Eco-Friendly: Earth friendly material and safe process. Fast-Acting: Area is ready for use in as little as 15 minutes.